E-commerce software and platform provides effective solution to the online stores. Further, the main features of ecommerce software and platform are shopping cart software, shopping cart solution, online store builder, ecommerce website builder and others. Apart from this, ecommerce software and platform operates with an integrated shopping cart, search engine optimization (SEO), email marketing, analytics and others. The global e-commerce software and platform market is expected to expand at a robust CAGR over the forecast period i.e. 2018-2027. Factor such as high disposable income coupled with growth on consumer spending on clothing is anticipated to increase the growth of global ecommerce software and platform market over the forecast period. Moreover, ecommerce industry has grown remarkably well in the previous years and is likely to witness exponential growth in the upcoming years. The market is segmented in five major regions including North America, Asia Pacific, Europe, Middle East & Africa and Latin America regions. 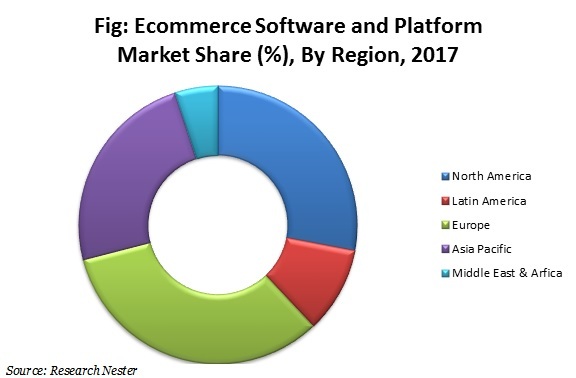 Among these regions, Asia Pacific is projected to dominate the overall ecommerce software and platform market during the forecast period. Rise in number of business establishments is providing many opportunities for the e-commerce software & platform service providers. This factor is expected to positively impact the growth of e-commerce software and platform market over the forecast period. North America e-commerce software and platform market is poised to grow at a poised rate over the upcoming years. Rising number of startup establishments across the region is fostering the growth of global ecommerce software and platform market over the forecast period. Europe region is expected to observe outstanding growth in the upcoming years. Increasing consumer spending and increasing number of e-shoppers is anticipated to drive the growth of global ecommerce software and platform market over the upcoming years. According to Ecommerce Foundation, U.S. ecommerce turnover was held to be USD 595.1 Billion in 2015. This factor is anticipated to positively impact the growth of global ecommerce software and platform market over the forecast period. Further, rising trend of online stores and e-shoppers is expected to positively drive the growth of the global ecommerce software and platform market over the upcoming years. In addition, the demand for business travels is increasing in the North America due to the rise in travel & tourism industry. This factor is anticipated to be the dynamic factor behind the growth of the global ecommerce software and platform market over the forecast period. Further, global ecommerce market is believed to benefit from rapid urbanization and rising disposable income of the people over the upcoming years. Apart from this, government of various nations are promoting and encouraging startup establishments. This factor is expected to drive the growth of global e-commerce software and platform market over the forecast period. Moreover, increasing penetration of smartphone and growth in internet connectivity across the globe is expected to robust the growth of the global ecommerce software and platform market over the forecast period. However, high cost of advanced such as hybrid and cloud based software and low internet penetration rate in undeveloped countries are some of the key factors which are expected to limit the growth of global ecommerce software and platform market over the forecast period.